It was a tough road but you are a Cancer Survivor. Share your story, so that you can create additional Cervical Cancer Awareness wearing your own Personalized Cancer Survivor Shirt. This is a beautiful gift for your Mom, Grandma, Sister or Best Friend. Our Cervical Cancer Awareness T-shirt is available on our premium 100% cotton shirts, machine washable in youth sizes XS-L & adult sizes S-3XL. Includes FREE Personalization! 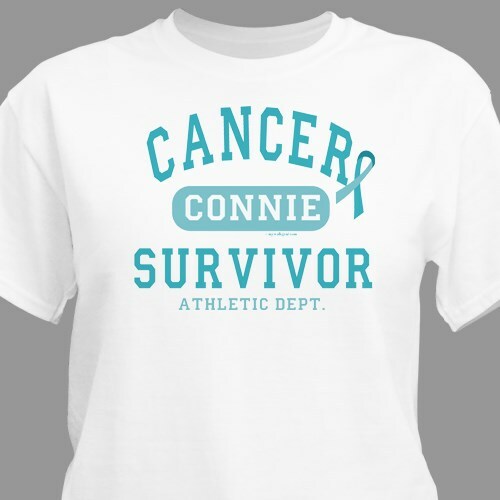 Personalized your Cervical Cancer Survivor Shirt with any name. Additional Info Our goal, at MyWalkGear.com, is to raise public awareness and understanding of Cervical Cancer along with many other cancers that people and their families suffer from. We are proud to help make a difference in the lives of those who are diagnosed with cervical cancer so we have created a selection of eye-catching Cervical Cancer Awareness Apparel and Walk Gear items for you and your loved ones to helps spread awareness. Be sure to also take a look at our Fight Like a Girl Cervical Cancer T-Shirt and our Believe Cervical Cancer Awareness T-Shirt as well.